Today in Masonic History John Edgar Hoover passes away in 1972. John Edgar Hoover, more commonly referred to as J. Edgar Hoover, was an American attorney and director of the Federal Bureau of Investigation (FBI). Hoover was born in Washington D.C. For some reason no birth certificate was filed for Hoover's birth until 1938 when Hoover was 43. As a young man Hoover was a member of his school choir, participated in Reserve Officers' Training Corp (ROTC) and was a member of his schools debate team. Hoover's school newspaper hailed his "cool, relentless logic". During debates, on two key issues of the time, Hoover argued against women receiving the right to vote and the abolition of the death penalty. In 1917 Hoover received an LL.M, Masters of Laws Degree, from The George Washington University Law School. After graduating Hoover was hired by the Justice Department to work in the War Emergency Division. He quickly became to the head of the Division's Alien Enemy Bureau. The Alien Enemy Bureau was responsible for finding and arresting disloyal foreigners living in the United States. Individuals taken into custody were put in jail without trial. The Alien Enemy Bureau arrested 98 individuals and declared more than one thousand others as arrest-able. In 1919 Hoover became the head of the Bureau of Investigation's (predecessor of the FBI) new General Intelligence Division. The division was also called the Radical Division because it was the task of the division to find radical elements in American society to monitor and disrupt their activities. Around this time America was experiencing it's first Red Scare and Hoover participated in the Palmer Raids. The Palmer Raids went on for about a year named after the Attorney General of the time, A. Mitchell Palmer. The Raids sought out foreign nationals in the United States who were considered radical leftists and anarchists so they could be deported. The raids lasted about a year when the Labor Department, who were responsible for deportations and did not agree with the Palmer's tactics, put an end to them. In 1921 Hoover was made the deputy head of the Bureau of Investigation (BOI) and would be named the director of the BOI just 3 years later when the previous director was believed to have been involved in a scandal. During Hoover's time as Director of the BOI and after 1935 the FBI, he focused largely on what he termed subversive elements in the United States. These included Civil Rights organizations, organizations of related to the women's rights and any group looking to make political changes in the United States. In 1956 his efforts would receive a code name in the FBI called COINTELPRO (COunter INTELligence PROgram). COINTELPRO conducted a variety of operations after it's creation, and some before it's official start, that were questionable or plainly illegal. All of which Hoover claimed were in the best interest of National Security. Until 1957 Hoover denied that Organized Crime existed in the United States and refused to apply FBI resources in pursuit of it. This changed when a the Appalachian Meeting, a historic summit of the American Mafia happened and pictures appeared on the front page of newspapers across the country. Also during Hoover's time with the FBI he is credited with building the FBI into a large crime-fighting agency, modernizing police technologies, centralizing the fingerprint file and forensic laboratories. Hoover passed away on May 2nd, 1972. Hoover was raised on November 9th 1920 in Federal Lodge No. 1 in Washington D.C. He would be a dedicated mason and would receive a variety of honors from the fraternity. 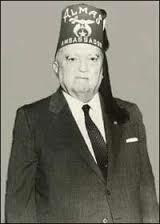 In 1955 Hoover was coroneted a 33° mason by the Ancient Accepted Scottish Rite Southern Masonic Jurisdiction of the Untied States(AASR-SMJ). He would also receive from the AASR-SMJ the Grand Cross of Honor. A room at the House of the Temple, the AASR-SMJ headquarters contains a room dedicated to Hoover containing personal papers and records.